Designed for small but busy workgroups, the well-connected Epson Expression Premium XP-820 is a multifunction inkjet printer. It has quick print speeds and delivers unbeatable quality on photos. The Epson XP-820 Wi-Fi 4-in-1 printer also delivers professional documents, copies, faxes and scans. This fully-featured unit can handle a wide range of media and even has a dedicated tray for CDs and DVDs as well as photos. The Epson Expression Premium XP-820 Wi-Fi all-in-one printer measures 17.2 x 23.5 x 8.1 inches and weighs 21.5lbs. 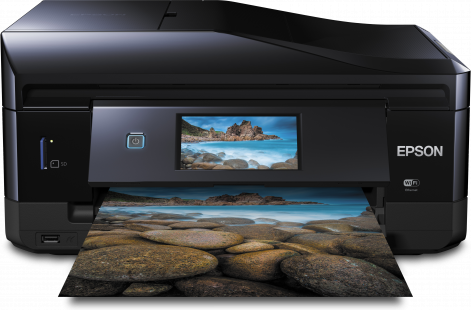 It boasts a 3.5 touchscreen display on the front flap, which automatically opens and closes when delivering prints. The Epson XP-820 inkjet printer also has a memory card reader and PictBridge port on the front. For paper handling, a 100-shete paper tray and 20-sheet photo tray is available. The Epson XP-820 Small-in-One also has a 30-sheet automatic document feeder. For connectivity, Ethernet and USB ports as well as Wi-Fi is offered by the XP820 multifunction printer. Users can easily print photos, thanks to the large display plus PictBridge and memory card slots. Printing without a PC is also possible. Users can also easily connect to the Epson XP-820 even without a router via Wi-Fi Direct. Print speed can go as fast as 14 ISO ppm for black and 11 ISO ppm for colour. Borderless photos 4 x 6 inches in size can be delivered in as fast as 12 seconds. The fax machine has a modem speed of 33.6kbps and can transmit in 3 seconds. The Expression Premium XP 820 photo printer also has built in memory to save 100 speed dials and 180 fax pages. Long-lasting photo prints can be printed with exceptional clarity and detail by the Claria Premium ink used in the Epson XP-820 Polar Bear ink cartridges. Running costs for the Epson XP-820 wireless colour photo printer can be a little high. Although photos are of excellent quality, texts are subpar. The XP820 4-in-1 printer also has limited paper handling capacity.